Old Pine’s colonial architecture is with us today — hidden from view by facade changes made in the 1790’s, 1837 and 1857. The 1768 church stands on its original foundation, retains its original brick walls (stuccoed and modified with different openings), and above it all is the original cedar shake roof (now encased in the attic below a steeper pitched metal clad roof). Philadelphia, by the 1760’s, was the fastest growing city in the English speaking world. The First Presbyterian Church near Market Street eased growth pains when a Second Presbyterian Church was built two blocks to the north. Worshippers to the south complained about the long walk up town through filthy, muddy streets. 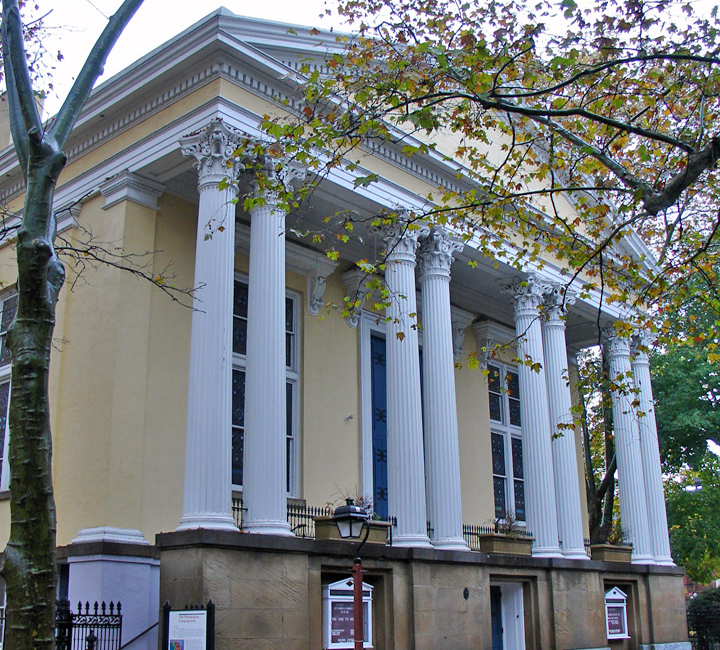 Aware of a need for a Third Presbyterian Church, Thomas and Richard Penn freely gave a lot on the edge of the City at Fourth and Pine Streets so Presbyterians could erect a new church and establish a burial ground. Once granted, a burial ground was laid out — reserving sufficient space to build a church. Burials began along the Pine Street side as early as May, 1766. Two years passed before architect Robert Smith was hired. He was a member of the prestigious Carpenter Company and had already designed churches for Second Presbyterian, St. Peter’s and St. Paul’s churches. For a new Third Church, Smith designed an 80′ x 60′ building on a north-south axis. Walls on the north, south and east sides had two levels of rounded arch windows. Entrance to the church was a centered pedimented door on the east wall connecting to a gravel path through the graveyard to Fourth Street. Inside the church, an east to west center aisle was flanked by high box pews with side aisles near both the south and north walls. A high pulpit centered on the west wall was accessed by opposing curved staircases with boxed rails. Two narrow rounded arch windows, centered on the west wall provided the only natural light (behind the pulpit) faced the worshippers. The first service preached was the first Sabbath day in June 1768. When the British marched on Philadelphia they conscripted Third Church for use as a hospital to keep wounded soldiers warm. It was a cold winter! Troops removed and burned pews, flooring and the pulpit. By early spring they burned many of the window sashes and frames. When the British left Philadelphia, the new Third Church was in ruins. Gradually, repairs were done as money became available. In 1792, a gallery (the first ever in the church) was built along the length of the interior east wall. A cellar was dug under the pulpits so dry wood could be stored. An elevated deck was built over the cellar on top of which a new elevated pulpit was built. Missing windows were replaced. Then followed the first of several changes to the original facade. The centered entrance door on the east wall became a window—the opposing end windows became pedimented doors. By 1835, the church had growing pains. The only practical solution was to horizontally bisect the large, single room sanctuary and create two levels. Worship orientation was switched from east-west to north-south. An extension at the midpoint of the south wall created space for the new pulpit. A new primary entrance was added to the Pine Street facade. Palladian windows above the centered entrance provided much needed light for two opposing interior curved staircases with open side rails. In all probability, additional window openings were created on the west wall. The exterior facade was uniformly stuccoed. In the 1850’s space again became a problem. This time there was a need for additional galleries, Sunday School and meeting rooms as well as office space. A decision was made to take the “unsightly and unattractive building and transform it into a beautiful and classic temple—uniting venerated antiquities with demands for modern taste.” To accomplish this, the church hired noted Scottish-born e’migre’ architect, John Fraser. By 1857, Fraser had cloaked the last vestiges of the 1768 building behind a fashionable Greek Revival edifice. A new metal clad roof of a higher pitch was raised over the original covered with cedar shakes. The north facade was extended to the sidewalk at Pine Street. Opposing steps of granite led upstairs to an open air portico supported by paired Corinthian columns. Window openings on the east and west walls were widened, squared off, elongated and glazed with clear colorless glass. Gas lighting was installed throughout the building. In 1868, the interior sanctuary walls were elaborately stenciled above the wainscoting. Stained glass windows gradually replaced the clear glass. In the 1960’s-1970’s, the sanctuary walls were re-stenciled with iconography celebrating the merger of the Third, Scots and Mariners Presbyterian Churches. New plumbing, utilities, lighting and renovated room spaces completed the modernizing. Affectionately known as Old Pine, the church building has stood the test of architectural endurance for nearly 240 years.